The Super Deluxe iterations of certain Sega games have always been a treat, so when Arcadeheroes.com reports that a SDLX version of Daytona Championship USA is rumoured to be appearing at new FEC, InterGame’s ears pricked up. Lucky Strike Social in Chicago, US is said to be the location for the extravagant version of the iconic game and before February ends, players may just be getting their hands on it. According to website, the Chicago Eater, the venue will be a 30,000sq.ft proposition with a 100-plus machine arcade. SDLX versions are essentially exactly the same game but with much larger cabinets, artwork and in the case of the rumoured Daytona, a “motion” function. 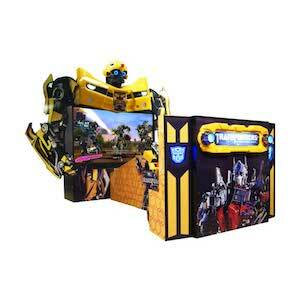 Other previous games which have enjoyed the SDLX make-over have been Out Run 2, Hummer, Showdown and Transformers: Human Alliance which sported an enormous 80ins screen (pictured). There has been no official confirmation, but should there be, you’ll be able to read it here.